Tip: If you're replacing with an aftermarket screen and it doesn't fit very well, sligtly trim the top and bottom edges of the plastic screen bezel (the edge facing inwards into the phone so that its not visible after assembly). You can also trim .25mm or so off the top slot protrusions that lead the screen into the housing. Lastly, if the screen assy is bulging or loose near the volume buttons, apply some thin double-sided tape to the screen assy metal brackets (the ones that slot into the housing). This will create a very tight fit, but allow removal if neccessary. i finished but now when I touch the screen nothing works??? how do I fix this????? I think you mean “how to get the LCD of the glass” you cannot remove it form the glass easilly as it is glued, you’ll just have to replace the entire front diplay assambly. so if your frame is bent, do you recommend not doing a screen replacement? or just be careful? I just finished replacing a 5S screen and everything seems to be working great except the touch ID function. I was extremely careful and nothing was ripped or torn. All the above steps were followed exactly. The home button functions perfectly but the scanner isn't responding at all. It doesn't even an error fingerprint......you put your finger on and nothing happens at all. I'm not sure if this means I just didn't secure the connector correctly or if something else is wrong. Any ideas?! Thanks! John, I am a repair tech at a local phone fixing shop. You may have already fixed it, but after checking if its clipped in, do a hard reset at least 2-3 times. That's ALWAYS fixed it for me if the connector is securely fastened. Touch ID was not working after screen replacement. When went into settings> touch ID & Passcode and turned iphone unlock on it would show failure. After doing a hard reset it worked perfectly. I get a lot of flickering after replacement on the screens after doing 5s repairs. Is this do to defective LCDs or bad technique? I have been working with cell phones for a long time...but the amount of flickering screens I have been dealing with when doing 5s and 5c repairs is large. Any suggestions? Thanks for the warning y'all about the ambient light sensor and fitting the screen down without breaking it. I also used the camera riser and the other "riser" for whatever was right next to the light sensor? Either way I transferred them to the new screen and made sure each piece went in order from lowest to highest. EVERYTHING works! My screen was so cracked I actually had to pick out pieces because the suction cup wouldn't stick, that was fun. My advice.... GO SLOW! look around before you yanking things off. and finally put things back in order, it sounds elementary but if you do each of these things you should be fine. God Luck! Check the LCD connection. Do a hard reset. I completed the screen replacement but now the iPhone is not charging at all. It shows the battery logo when plugged in at a thin red line and did not move witha whole night of being plugged in. Do I need to recheck something ? I followed this guide and it all worked perfectly. You really do need to be careful when lifting the screen, as the ribbon cable is fragile. Also, I did move the front camera raiser from the old screen to the replacement screen, which was not mentioned in the guide but was mentioned by boss302beav, so thanks for the tip. Hi, work as a technician for a phone store and I have been fixing phones and computer for about 3 years now, last week I changed an LCD on an iPhone 5s and the screen just turns blue when it's coming on, the apple logo shows up but it doesn't come on just go blue and reboot anyone had this problem before please let me know thanks. What should I do if the screen is so horribly cracked that I can't good suction to lift the front? My screen was shattered spectacularly. I used two overlapping pieces of clear package tape to make a smooth surface, and I was able to open it easily using the iSclack. I believe the iSclack also comes with iPhone-sized adhesive tape strips for exactly this purpose. Put clear packing tape on the screen. Put masking tape on the glass and it should allow you to use the suction cup as usual. As some others stated, I did not remove the cable assembly from the shield either. It looks like it would be difficult to do without tearing. Since I don't have a microwave, I couldn't use an iOpener. Instead I put a hair dryer on high and aimed it at the front of the screen for about 10 minute and was able to pop everything off. If you do this, don't do it near where you've taken the phone apart since the hair dryer will happily blow the screws you need for re-assembly far away. When Re-assembling the whole thing, there are tabs at the top of the screen that need to fit into the top of the metal case for the whole thing to close. I found this to be one of the trickier parts - if they don't engage properly, and the rest of the case seats, the screen doesn't lie flat and you need to go back to the suction cup to separate it again. Look at the inside top of the old screen under a bright light before doing this and it will be easier to understand how it engages. 1. Make sure you have eye sight a surgeon would be jealous of, you will need it. It's difficult to believe how small those screws are till you get them out. 2. Buy the suction pliers. I tried the one suction cup and by God's grace didn't rip the cable right out. It was MUCH tighter than I imagined. I was being super careful and still it popped off with tremendous force. The clip flew off and amazingly the cable didn't snap. 3. Bright light, magnetic pad for the screws and lots of care you can do it. I completed the repair successfully, I did have problems trying to lift the cracked screen with the suction cup, one trick I did do was using a small paperclip inserted into the pentalobe screw hole and rocking it upwards to help lift the screen, once I got it lifted slightly I was able to insert the spudger into the bottom left were there is a small indentation that looks like it is used specifically for prying up on. I was able to then lift the screen up without using the suction cup. This guide worked very well! The hardest part was getting the front panel off using the suction cup. It was very hard to get a tight seal on a cracked screen. After that I got the rest! If you don't have an iOpener, a hair dryer works really well. replaced Iphone 5s front panel. Cables attached easy, most everything was smooth disassembling and reassembling, but I could power up my cracked phone before, I cannot power it up now. Checked cables twice, not sure what the problem could be. Any suggestions? I completed this installation using this guide which was very helpful. However, the touch screen only works for a few minutes after the first start up. Works very smoothly for awhile, then the touch gets very insensitive, then no response on the touch. I've reassembled it again making sure the ribbons are firmly connected. Again, it only works for a few minutes. Ok.. I managed to successfully replace the cracked screen of my phone but.... the new scream has a lighter/yellowish halo in the upper-right corner... just below the bluetooth icon. At first I thought it was maybe a poor quality replacement screen.. then I realised that it happened only when the screen is fully pushed in the phone case. I tried a few times to detach again the screen from the main body, and push it back again.. when detached it looks good enough, when pushed it the halo appears again... any clue if I might have done anything wrong or it's just a bad screen? I did that fix this weekend, For me the most difficult part was to remove the Upr speaker, front camera and looms assembly and to put it back in place prorperly on the new front panel. After re-installing everything, I recommmend to test on the screen to see if there is any trouble with the phone on (as mentioned in the guide I had some white lines, so I went back to plug again the connector. Finally the front speaker was propably damaged during the re-assembly as it is now working but with distorsion in the caller voice ! I guess headset and bluetooth devices will do from now on ! It was the first time I tried to repair such an electronic device. Only managed it with the information given in the forum. Great job, thank you all! The display stayed black after the first re-assembly and the hint to disconnect the battery did the trick! Thanks again! Does anyone encountered the issue that the touch screen is not working when placing iphone on an insulation surface? Managed to replace the screen following the above guide no problems. Still have them vertical lines (tried reconnecting LCD cable, disconnecting battery and several hard starts) and only other problem is my battery is now draining. Any ideas? Used to last at least a day, now I'm lucky if it lasts 6 hours. You can almost see it draining away. Just completed the replacement of my screen. The guide was very helpful as well as watching the video. To keep all the screws organized, I just drew a large picture of the inside of the phone on a piece of paper and made loops of clear packing tape and put them over the areas where I was going to remove parts. That way I could make sure each screw went back into the proper place. Took about an hour from start to finish. One tiny glitch, the screen isn't perfectly snugly down at the top of the phone, there is a little play. It is tight everywhere else. Oh well, no biggie. All good now. I have a problem with the battery swelled 5s and the display was put in coores stripes etc , and when opened, deconectarlo no longer start. there any way to recover the flex cable? The part I worried about the most was removing the Home button but it turned out that was quite easy as long as you took your time removing the gasket from the panel assembly. I did not even use any kind of heat, I just SLOWLY pushed on the button from the opposite side to loosen one corner. The rest of the gasket came off pretty easily. The hardest part by far was getting the front-facing camera, ambient sensor, and proximity sensor back in place during re-assembly. Getting these small parts in the right places took about an hour and was the most frustrating part of the entire process. The 2nd hardest part was reconnecting the Home button cable to its socket. At this point the phone case is just partly open and there is very little space to work with. Once everything was back together, I discovered the screen wasn't responding to touch commands. I had to reopen the phone and reconnect the digitizer cable (it was loose). All appears to working fine. Total time was about 3.5 hours. I lost the white pad for the proximity sensor is it ok if I forget about it and move on? I've made this repair three times so far, and it is only this last time that I realized that step 31 (peeling flex cable from shield) was/is not needed. If you are removing the whole shield anyway and relocating it to your new screen+digitizer, it naturally will come with it. One word of advice. The magnatized phillips head screwdriver is your friend for removing and installing screws. Using it allows you to pick up and place screws with less chance of losing it. Using tweezers has caused those tiny screws to jump away from me like mexican jumping beans, and they can jump very, very far. There is only one screw that is not magnetic, it's near the compass, and is installed in the square sheild that covers the three flex cables. The screw is located at the north east corner of the shield. If you have the tools and take your time, and read and watch the videos, this is a fairly easy and straight forward repair. I removed the front panel, but don't see the battery have a plate, the home button stays on the case. Model A1533, so iphone 5s. Really don't know what to do from here? After refitting everything, the apple logo appairs and then nothing happens, but only after fitting it to a charger. Any ideas of what casues this? This guide doesn't mention anything about the extreme likeliness of having to restore the phone due to this procedure... didn't back up phone prior to the Front Panel replacement... lost all data. Had done this on an iPhone 4s without requiring a restore/hard reset. I'm interested if this is at all similar to others' experiences. apple tells you to back up your phone even when you bring in for the smallest repair (obviously for liability)… but why would you not do that for a DIY? Grazie Fixit ..con Voi ho imparata a riparare telefonini e per puro piacere ho risolto decine di problemi a miei amici. Great fix!! Replaced my screen and digitizer in just under a half hour (I'm an advanced repair person). The hard part was closing the project. If this helps I lowered the ear piece side in first and gently pushed until it would not give anymore. At that point you can see its not fully seated into the case. I laid the phone face down on my desk and gently pushed on the back being sure to evenly place my push force. It snapped right into place. Now my iPhone 5s is like new. Completed the repair in about an hour with the bare-bones iFixit screen replacement. It really helped to have a good tool set, good light and a magnifying hood and a great guide. • I also used an old diaper-like cloth to work on. This has saved my bacon countless times as it keeps little screws and bits from bouncing off into oblivion, while making it really easy to spot them. • The screen I had was utterly fractured. Several layers of packing tape were necessary, and even then the glass wanted to separate from the digitizer when pulling it up. It came up from the middle and I just used a spudger to work it up. • I did not have the iOpener. I used a hair dryer and got the whole screen fairly warm. Everything detached easily. • Be sure the frame where the screen fits is clean. I used a spudger holding the phone upside-down to scrape out the crud. I also smoothed out a big ding in the frame with a metal spudger, very carefully scraping and pushing it out. The new screen went in like butter. I've replaced the screen on 5s but it now doesn't power up, it flashed the apple logo a few times?! Help please! Great job ifixit people. I was hesitant on starting this process but followed all of your steps meticulously. The availability of zooming in on the pictures helped my 43 year old eyes. The tools i ordered for the repair came with a kit. I used all the tools. Great Job. I got a little lost at the point of separating the screen from the rest of the assembly (camera, light sensor etc...) but overall amazing guide and great replacement part. After a few hours of squinting and holding a flashlight in my mouth while cursing the tiny screws under my breath my 5s is as good as new. SEPARATE AND LABEL YOUR SCREWS!!! Thanks for another great fix experience iFixit. I followed the guide and it worked great with one exception. My home button no longer works. The screen I purchased was a complete assembly so I did not need to remove the old home button, LCD, or camera display. I've double checked the connection for the home button and it is secure but it does not function. What do I do now? If you want Touch ID functionality, you always, always, always need to transfer your original home button to your new display—regardless of whether it came with a new home button or not. The embedded fingerprint sensor is paired to your phone's logic board at the factory and will not work if swapped out for a different part. everything perfect but Touch ID does not work. I think it's iOS 10 a lot of people who repair dozens of iPhones are saying Touch ID doesn't work after it gets unplugged. Thank you so much!!! I just replaced my wife's screen, she's been limited to Siri control for months, now I guess I'll be losing her to texting and Facebook, LOL! Thanks!!! This was pretty easy and everything works great now. I appreciate the detailed instructions. A few things went different than pictured/described, but in the end my iphone works perfectly and looks great! So this is my second install of a new Lscreen, last time the screen diagnosed fine then came back to me with dead spots... I installed another new one and after a while the screen starts having dead spots. whats up?? I completed everything, and everything seemed right, and it turned on successfully- went passed the apple screen to the home screen. But then it wouldn't register touches or pressing the home button. Any ideas? Thanks! Lifesaver! Thank you so much for this guide! Always so great to know I can count on iFixit's guides. I know this is totally gonna sound like I'm getting paid for this review, but seriously, anyone looking to fix their phones should consider getting that little case that the lady showed. It's got everything you need to fix your iPhones. I have probably fixed like 4-5 phones already and this kit has always had exactly the right tool. just completed a screen replacement. so far, so good. will keep an eye out for dead spots, stripes, lines, flickers, and all the other things that people mention. was hoping my non-functional touchID would magically return (it stopped working way back when i replaced the battery), but no luck. another great ifixit guide. only hiccup was not realizing right away that the proximity sensor has a little rubber bracket and diffusion screen that must be moved over to the new screen as well. but the comments helped a ton. I'm about to change my cracked screen but I was wondering with so many of the components using adhesive how do you glue them back into place or is the existing adhesive still strong enough to stick on the new display? Typical iFixt screen replacement tutorial… Several unnecessary steps, they make you remove components that has nothing to do with the screen and that you don’t even need to remove in order to replace it. For instance, you can complete ignore steps 14, 15, and 16. Also, steps 32 tells you to remove the adhesive, which is totally unnecessary if you’re going to remove the shielding as shown in steps 42 and 43 and use it on the new screen, I would even advise to not remove the adhesive so it will be placed exactly like it was, and will stick better (adhesives never stick as much once removed). Don’t get me wrong, I like the detailed steps and the great, clear pictures, but I think I’ll have to agree with Louis Rossmann. iFixit tend to makes things more complicated than it should be. Oh, it’s not right advice actually. Before operating with any sockets, cables, connectors etc. you have to turn off the power of the device. 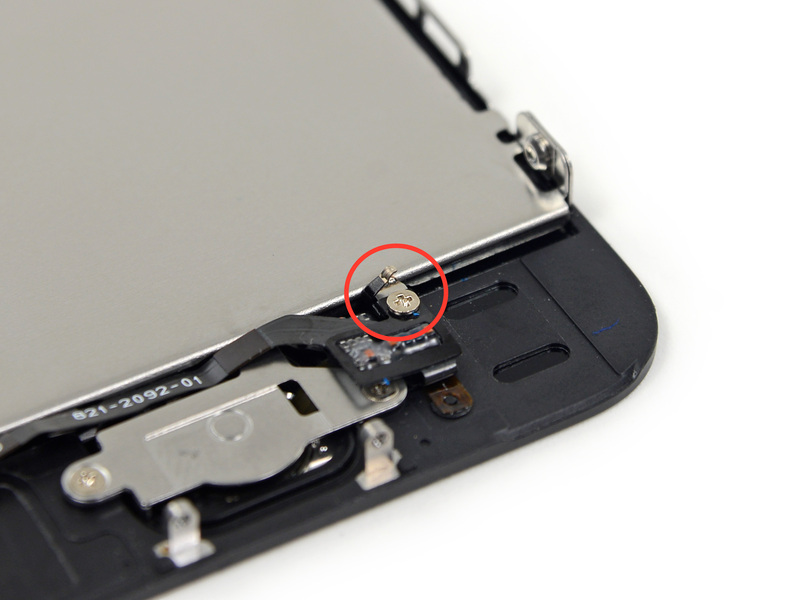 Exception is the home button connector, because you can’t get to a power connector without detaching it. I lost a few of my screws like a dumbass what do i do. Its an incredible rush. Its very nerve wrecking. Its exciting. And pretty difficult. But when its reassembled and it seems to work. You’re as proud as kid who drew its first drawing. Wow %#*@ i did this. Haha Thanks ifixit and author for this guide!!!!!!! Excellent thanks, didn’t encounter any problems by following the steps ! I’m having some issues after following this guide, unfortunately. I replaced the battery and the display. The display and battery and all functions seem to work fine, except the most important one; the touchscreen. It’s completely unresponsive now. Also, there is a dim corner in the upper left-hand side of the screen. Does anyone know what the cause of this is? Can any kind souls please help me out? Thanks in advance. Hello. I now have charging problem, phone won’t charge (it has small red bar but never charges). I didn’t disconnect battery, while replacing screen. Could this wrong precedure damage charging IC? If a 68 year old with not so good eyesight and fat finger syndrome can do this, then it has to be a good tutorial. Worked for me!! I changed the screen but the digitizer is not working. I think that it’s a shortage somewhere. Do you have any idea what should I look first? Followed the guide, but broke my screen while assembling it back together. have to order a new one again. Très bon tuto, facile à suivre et particulièrement réussi ! Opération accomplie, ma fille est contente..Que demander de plus !